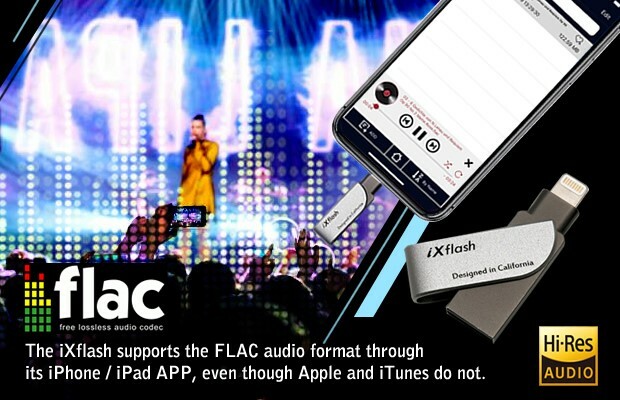 The iXflash supports the FLAC audio format through its iPhone / iPad APP, even though Apple and iTunes do not. So, the FLAC format is better than MP3, great, everyone should just download all their songs as FLAC files, what’s the big deal? The key is, if you like listening to music through your iPhone/iPad, you’re out of luck because Apple doesn’t support the format through their Music / iTunes player, including your iPhone or iPad. That’s where Vinpower’s iXflash comes in to save the day. Even though Apple doesn’t support FLAC, you can listen to all of your songs saved in the FLAC format through an iPhone or iPad by using the iXflash APP. Whether you’re storing your FLAC music files on the iXflash drive itself or directly inside the iXflash App on your iPhone or iPad, you can easily hear every Lossless note of your flawless audio files. For more details about this item or any of the products Vinpower Digital manufactures or distributes, please visit our website, www.vinpowerdigital.com or contact a Vinpower representative in your area.